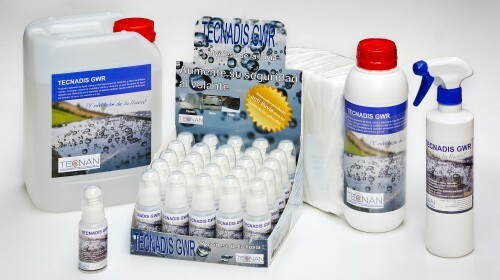 Water repellent for vehicle windscreens – TECNAN-NANOMAT "Think big, Act Nano"
TECNADIS GWR is an innovative rain, snow and ice repellent product designed for vehicle windscreens. Thanks to its water repellent effect, raindrops barely touch the surfaces and roll easily until disappearing from the windscreen. The result is an improved both day and night visibility when driving without needing the use of wipers. – Suited for the glass treatment of cars, trucks, buses, trains, etc. – Product easy to apply. – Good resistance to abrasion (washing systems, wipers, etc) with a durability of up to one year / 15.000Km. – Prevents freezing of crystals in freezing conditions, being easy to remove the ice from the glass treated. – It does not release hydrochloric acid when it is applied.